How many of you know the legend of Bacchus? Bacchus was the inspiration behind CalligraphyCats which has now evolved into CalligraphyPets®. We adopted Bacchus and his brother, Cheshire in May 2001 as mates for Eros, the resident king of cats. 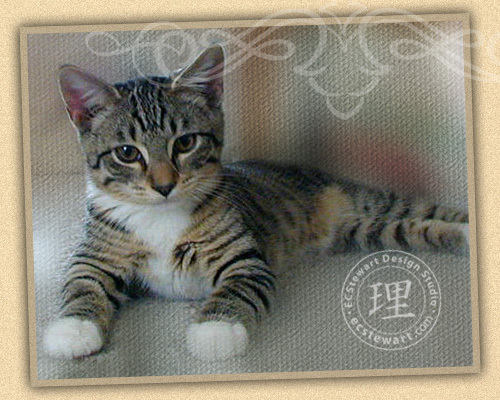 As adorable tabby cats, they revealed their wonderful personalities through play and mischief. During Christmas season 2001, my mother n’law sat frantically knitting a gift for an expectant mother during our ‘movie hour.’ Under low light, naturally, our beloved pussycat, Bacchus absconded with her ball of yarn. Rescuing the yarn from certain peril, I realized the wonderful feline gesture highlighted by the glow of the movie was similar to that of calligraphic lines. I went straight to my sketch pad and began feverishly illustrating the numerous gestures that cats exhibit. During that time, we we’re owned by three (3) cats with 3 distinctive personalities; I insisted that each be represented within this first series of line work. Throughout time, each cat exemplifies various traits, therefore, each cat is appended with various nicknames -and I’m sure you’ve got a few of your own. Given the season, the famous story “T’was the Night Before Christmas’ was influential in providing a meter for remembering the gestures of the cats. Pouncer, Bouncer, Chaser, and Lay; Beggeth, Purreth, and Runneth Away! Strutter, Lunger, Licketh, and Play; Stretcher, Stalker, and Walketh Away! Fetcher, Beggar, Jumper, Await; Snoozer, Pointer, Scratcher, and Shake! Since the series inception, our small litter has seen bittersweet growth and loss and continue to remain inspired by their primal and comical ways of enjoying life. Gestures of Eros can be found showcased as Beggeth in CalligraphyCats V1, and Eros & the Empty Bowl in CalligraphyCats V2. Cheshire can be found as Purreth and Runneth Away in CalligraphyCats V1 and Licketh and Walketh Away in CalligraphyCats V2. Bacchus, naturally, is our showcase feline. As Bacchus & the Ball of Yarn remains to be the number 1 image in our line up, we have fun designing products based on his image -even abbreviating it on jewelry and leathergoods. Meanwhile, I have created more cats, dogs, pets you’d find on farms, woodland creatures, and even animals with celtic influence! The past few years, you have embraced my calligraphic style and have shared them with your friends and I can’t thank you enough. I am striving to create new imagery and innovate new products just for you, whether it be something we design in our own workshop or with partners. You will begin to see luxe products with paisley designs, wine, flowers, Adrinka symbols, breed specific dogs and even pop art with a calligraphic touch. Please stay tuned to the additional products we will be revealing in the near future. You won’t want to miss them!